Environmentalists currently represent a small subsection of activists in Egypt, but like everybody else they've received a boost from the revolution, as well as more problems to deal with. The former comes in the sense that people are generally more willing to pay attention to the kind of political, economic, ecological and community problems environmentalism attempt to deal with — everyone is more empowered and has a great sense of community belonging. Yet, at the same time, the partial collapse of the state has led to many abuses (most notably illegal construction) and many people prioritize security or party politics ahead of environmentalism. Many are trying to bring attention to this issue oin political gatherings, on Twitter and blogs, and elsewhere. 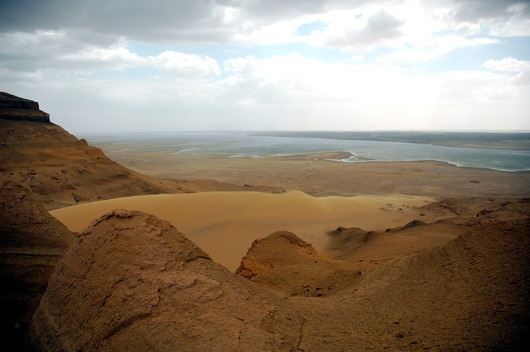 The Amer Group, the Egyptian real estate developer responsible for Porto Marina and Porto Sokhna, massive tourism developments along Egypt’s North and Ain Sokhna coasts, plans to build “Porto Fayoum” on 650 acres in the Lake Qarun Protected area near Fayoum Oasis. Former President Hosni Mubarak’s government sold the Amer Group this land for only $28,000 ($.05 per square meter), according to Egypt’s American Chamber of Commerce. This is the first development of such huge proportions to be allowed in an Egyptian protected area. This and other tourism developments planned for a 10-kilometer stretch of coastal land along the northern part of Lake Qarun will undoubtedly wreak untold damage to this pristine, scenic desert area, known as Gebel Qatrani. This area contains one of the world’s most complete fossil records of terrestrial primates and marshland mammals and remains critical to our understanding of mammalian–and human–evolution. Read more about it here, where you can listen to a podcast featuring NCE activists.